Why use artificial nest cups? A. To entice a pair of barn swallows who have chosen a site unacceptable to humans to relocate. One site considered unacceptable by many homeowners is directly over the front door, where droppings fall on the entrance. This frequently happens because the outdoor light fixture above the door is one of the few sites where the barn swallows can anchor their mud nest. Also, the front yard is often a virtual wasteland of 2" tall grass, seemingly uninhabited. The humans leave early in the morning via the automatic door of the attached garage and return in early evening via the same route. The front door may not be opened for days at a time and the barn swallows feel they have found the ideal safe nest location, of little interest to predators and apparently deserted by humans, compared to a busy farm yard. Another sometimes unacceptable site frequently reported to me is inside a horse barn or other outbuilding. This can be a problem to the humans either because this requires always leaving a window or door open in the building during the nesting season or because the human activity in the building will not be compatible with the swallows' nesting, or because the interior of the building and its contents must be kept clean. B. To attract barn swallows to a new site. Nest cups placed in desirable locations. are the best bet to attract barn swallows for the first time. Whether this is because the swallows may think a pair previously nested there or because the nest cup saves them the major job of nest building is not apparent. C. To allow an existing colony to grow. Where limited nest sites exist due to a lack of suitable surfaces for building mud nests, the addition of artificial nest cups allows additional pairs to nest. Nest cups can be placed anytime during the period when barn swallows are present. 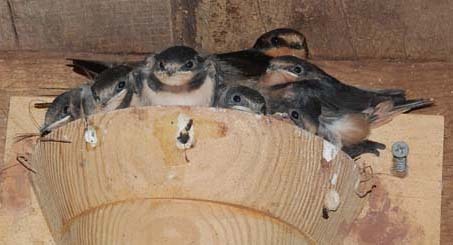 By late July or early August, it is too late for barn swallows to begin a second or third brood, but young unmated birds may check out new sites during summer and return to them the following year. It is not uncommon for a few barn swallows to begin a nest or add mud to an artificial nest cup near the end of the breeding season. Whatever their reason for doing this, it is exactly what you want. They are selecting a nest site, even if it is too late to nest. If you plan to try to attract barn swallows to your yard next year, your chances will be greater if nest cups are placed this summer. Offering nest cups anytime during the spring and summer may attract first time nesters the following year. If your nest cups are hard to reach, it is not necessary to climb up and remove and replace them each year. 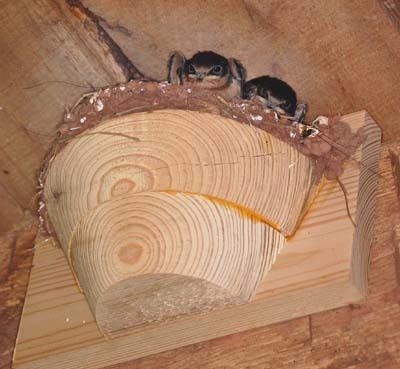 However, if you can, it may be very beneficial to empty and wipe out the nests immediately after each brood fledges. This will remove the accumulation of nest parasites, especially mites. Should nest cups be emptied and cleaned between broods. Emptying the nest cup as soon as the first broods fledge will likely increase the chances of its immediate reuse for a second brood. (I haven't tested this yet because second broods were already begun when I emptied the old nests in 2001.) It is well established that barn swallows access the degree of mite infestation in their old nest and change nests or build a new one when the old nest is heavily infested. HOWEVER - I don't know if they make this decision during the last days of the first nesting, when their nestlings are heavily infested or if they will reaccess the degree of nest infestation once the first brood fledges and the human has promptly emptied and cleaned the nest. Empty nests are rather frequently visited by adults, so it is quite likely that the cleaned nest will be accepted by a pair for the second brood. Interestingly, this also almost assures that the emptied nest will be reinfested by one or more of the visiting adults or by one of the fledglings returning to roost there one more night. But a new infestation of a few mites doesn't compare to the 7th and 8th generation hoards of thousands of mites in the old infested nest. Some of these mites will overwinter and infest next year's nestlings. However, a few mites also make the several thousand mile spring migration riding on the bodies of returning adults, so mite infestations in the nest are very much a part of the barn swallow's life. Heavy mite infestations are responsible for only a small number of nest failures in our colony. So, there is no need to run for the insecticide or try to sterilize the nest cups. This would be pointless, since the swallows will reinfest the nests anyway with mites carried on their bodies. Barn swallows and both tropical and northern fowl mites have coexisted long before we humans began to interfere. In August, 2001, when I discovered that the last four nests in our colony were deserted due to heavy mite infestations, I looked at the teaming mass covering the rim of one of the nests under a stereo dissecting scope. In the very first field that I viewed was a spider busily wrapping up several mites, still kicking, while hundreds of other mites were rather rapidly crawling around and over each other. After a moment I realized that this spider was tiny - less than 1/10 inch long, as measured in the eyepiece micrometer. Did all of the mite infested nests harbor these spiders? How wonderful! When the barn swallow young fledge, the mites lose their host. The hungry mites then become phototactic, and, in the process of crawling toward the light, end up on the rim of the nest, in a perfect position for attaching themselves to the foot of any adult swallow that may land on the nest. Some manage to grab a new swallow host, others leave the nest, probably expiring before reaching another nest, others remain in the nest, most dying in winter, but some surviving to await the returning swallows the following spring. But, what of the tiny spider? He has an almost unlimited food supply. He is, as they say, in hog heaven. If a human should poison the nest with Sevin, in the name of "helping the birds", the mite will be reintroduced by the swallows, themselves, but will the spider? Is this species a common inhabitant of the swallow room, crawling all over the walls and floors? Or, is it rather uncommon and confined mainly to the swallow nests, in which case, it may take a very long time to repopulate this nest. And, does it play a roll in limiting the extent of swallow nest infestations? Maybe not, but it suggests to me yet another reason to not use insecticides to "help nature". The minimum requirements for nest placement are adequate protection from rain, safety from predators, and privacy. In busy yards, privacy can be accomplished by height of the nest. The swallows would probably feel comfortable nesting under the eaves of a two story house, even with constant foot traffic on the ground below. However, they may not want to nest at half that height in such a busy location. Where heavy foot traffic is uncommon, nest heights of 8 ft are fine. This allows easy nest checks with a mirror on a stick and easy nest changes using a small ladder. Barn swallows frequently nest under porches, under elevated decks, and under carports. These locations should be checked for nest level temperature before installing nest cups. If the site receives afternoon sunlight and the roof has no insulation or ventilation, the air trapped just below the roof can rise well above the ambient air temperature. 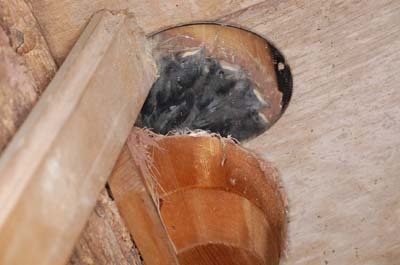 Please review the shelter page for more info on selecting or building a barn swallow shelter. Nests placed under decks need to be protected from rain water running between the spaced floor boards. A shingle or small piece of metal flashing can be tacked on the underside of the deck above the nest.